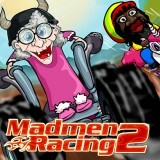 Madmen Racing 2 - It's your time to take part in the most exciting championship you have ever seen! That is why take you vehicle and control as better as possible. You can even kill all your opponents. Well, actually do everything to become the real champion!